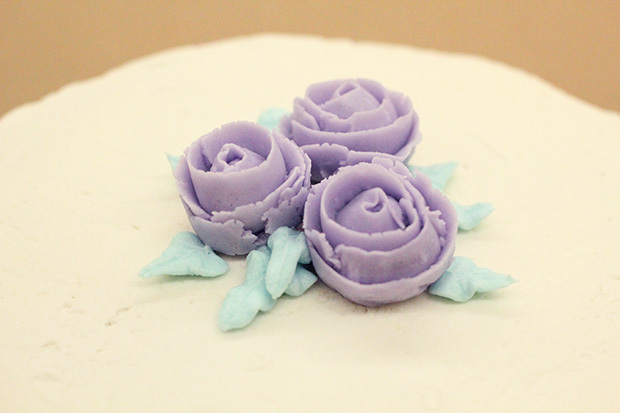 Wilton Cake Decorating Course Update IV: Cake (Again), Writing, & a Very Annoying Rose – amandarobots. It’s hard to believe that July is over: favourites time crept up on me, which is one way I keep track of time whizzing by in the summer months. However, throughout July, I also kept track of time on a week-to-week basis with my cake decorating course. I’d wake up every Tuesday and have to bake a different treat and whip up oodles of buttercream frosting tinted (mostly) pastel colours. Then, in the evening I’d haul it all into the car and drive to Michael’s. This past week was the final two-hour course, and it was cake time again. This time, though, we were all expected to have our cakes levelled, torted, filled, and iced smooth before we got to class. I did a vanilla cake with buttercream for filling, but I cheated by baking two thinner cakes rather than one normal-sized cake to slice in half. Ha ha. 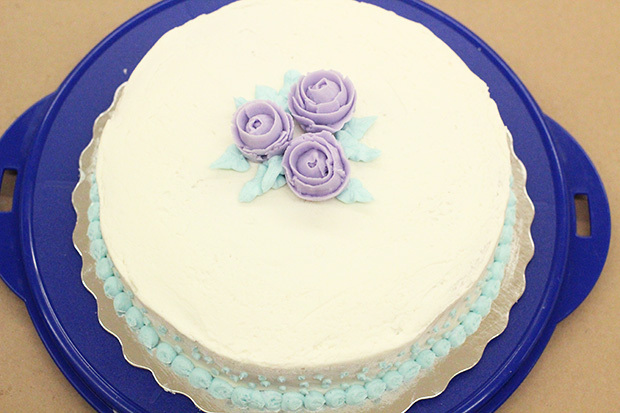 At class, we learned only two techniques: writing and the Wilton ribbon rose. Printing in icing is not a big deal at all. The trick is to not let the icing touch the cake as you’re writing; you start with a dot where your letter will start, then pipe a string slightly away from the cake, then bring it down and connect with another dot. Writing (cursive) in icing is a bit different, and – for me – difficult because of the number of times I might go over a certain line in my writing style. My final cake doesn’t have any writing on it, because what was I going to write? Unless there’s an occasion, I don’t think writing on a cake is necessary. Then there’s the rose, which is ubiquitous in cake design and, if you ask me, kinda old-fashioned looking. It’s not really my style, which is good because it’s a pain in the neck to do. You see those three wonky roses on my cake? Those are the best ones I managed. Out of a selection of 12. I suppose I’ll get better at it if I keep practicing, but in terms of flowers, I prefer zinnias – there’s something more modern about them. There are subsequent Wilton courses; there’s even a course 2 at my Michael’s this month. However, I would end up missing a course because of an end-of-the-month vacation, so I’m not doing course 2 this month. Maybe in September. Overall, though, I’d recommend this course to anyone who’s interested in baking or decorating cakes. It’s a great introduction to decorating techniques, and I feel like I have a solid grasp on virtually everything I learned. « It’s time for July Favourites!